Contract management forms an essential role in the construction industry. As the owner of a construction business, you are well aware of how crucial contracts are to your business. Whenever a construction company agrees to take on a new job, there will inevitably be numerous suppliers that have to be contacted. These suppliers help provide different resources to help get the job done. As a result, plenty of contracts will be drawn up to ensure that a legal agreement is in place between two parties. There are plenty of different types of contracts that a construction company will have to draw up. Some involve construction site safety while others explain the demands that need to be met upon project completion. There needs to be an efficient and effective way of managing all of them. Symfact developed state-of-the-art contract management software to help companies do just that. The whole purpose of contract management software is to simplify construction company managers’ duties. Such software provides construction company managers with an easy way of overseeing all of the different contracts you might have. It’s a one-stop-shop for all your contract needs; a place to construct them, view their life cycle and store them securely. This ensures that you consistently stay on top of contracts and never forget about them. The features in our contract life cycle management software will help you understand the fundamental obligations in individual contracts, along with any risks that might be present. Everything is in one place, so your organization will improve dramatically. In general, contract management will present your business with lots of benefits. But, using contract management software will take things to a new level. For one, productivity is dramatically improved. Business owners of all types work to implement new workplace accessories to improve productivity because it is crucial to success. All your contracts are stored and tracked online, so it instantly takes less time to find and manage them. Not only that, but you can use our software to view workflow cycles and automatically notify you when contracts are coming to an end. As a result, you will never miss any renewal dates, so you can keep updating contracts with different suppliers to ensure everything runs smoothly. Along with this, you will have a far more eco-friendly workplace. Understandably, the very nature of the construction industry makes it hard to be totally eco-friendly. So, if you can make your office a greener place, then you’re doing your bit for the environment. With contract life cycle management software, you negate the need for paper documents as everything is done digitally! You also benefit from being able to access your software from any device with an internet connection. Of course, you can decide on the security permissions as well, ensuring that only specific people have access to this data. But, it means that you can work from home and still view and manage your construction contracts, rather than needing to be in the office all the time. Furthermore, you can use contract management software to track different metrics for your business. It allows you to manage your contracts by seeing how your relationships have evolved with specific clients or suppliers. You’re able to view specific parts of your contracts to see how demands have changed, which can assist you when moving forward and approaching new contacts for contract agreements. There are many reasons that contract management in construction is so important, the main one being that it allows you to ensure that what’s agreed in your contracts is delivered. This is essential when working with new clients as you need to be 100% certain that you’re meeting their demands, and that they make a note of all their specific requirements. As a result, you can deliver a better service that ticks all the right boxes, leaving you with delighted clients. The same goes for your suppliers and vendors as well. 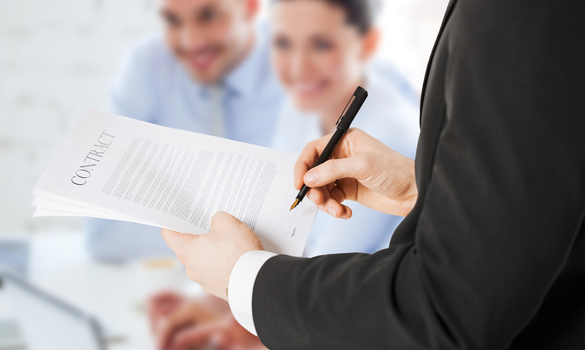 Contract management ensures that you get the most out of their services. With a good system in place, you can save a lot of money and get an excellent return on your investment. If you combine an excellent contract management system with quality bookkeeping practices, you will profit as a construction company owner. At Symfact, workers firmly believe that software is the way forward in contract management. It’s the most efficient way of managing contracts at any stage of their life cycle, and you have all the benefits listed earlier as well. To make things even better, the Contract Management Software can be tailored to your specific requirements based on your type of construction contract. So, you can add or remove features that are most beneficial and suited to your construction company. Again, this helps you get more out of your investment and ensures you have a piece of software that works for you. The bottom line is that contract management in construction is essential. It’s a vital part of the industry, and your business needs to start utilizing it right away or risk losing money and damaging relationships.